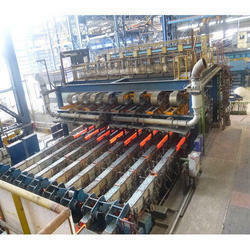 Our range of cooling bed dividing shear uses thermo mechanical treatment process for reinforcement bars. These Shears are generally installed after quenching line & before entry to cooling bed. The dividing shear cools straight bar lengths to a temperature suitable for subsequent processing , to align front ends of bars for better yield, to form layers for feeding. We are the leading manufacturer of Cooling Bed and our product is made of good quality. Automatic Rake Type cooling beds provided with twin channel bar delivery system or run in table with apron type diverters. These Cooling beds are equipped with bar aligning arrangement. We are one of the chief manufacturers and suppliers of an extensive range of Cooling Beds. Fabricated following international industry standards, these Cooling Beds are available in various varieties as per the demands of industries. We know the precise demands of our clients, and manufacture these as per their choices. We provide our clients with Automatic Cooling Beds. Cooling beds naturally cool the material as well as cross transfer towards the discharge end. Automatic Rack Type Colling Bed provide uniform air-cooling to the bars & profiles and transport these in phased manner from entry to discharge side. Made available in precision designed and engineered finish, these efficiently handle the requirements from smallest to maximum bar sizes that need to be rolled. The Emcel Divided Bed Activated Carbon Filter is designed to provide very high performance adsorption of toxic and radioactive contaminants. PP Rolling Mills Mfg.Co. Pvt.Ltd. Cooling Bed available with us, are widely appreciated by the clients due to their excellent features. Developed using high grade raw material, our beds meet international quality standards & norms. Further, these can be customized as per the specifications detailed by the customers to achieve maximum satisfaction. Cooling beds naturally cool the material as well as cross transfer towards the discharge end. PPRM cooling beds are designed using standard elements that can be combined in accordance with plant product mix requirements and production capacity. 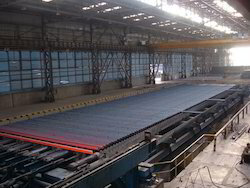 Cooling Beds are used after the last finishing stand to receive the hot Bars/Sections.